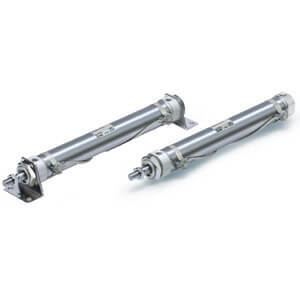 Series CM2-Z double acting, double rod, stainless steel cylinders are compact, lightweight and offer high performance. The piston seal and rod seal design provides excellent life. Transparent auto switch bracket provides visibility of the status of the switch. Rubber bumpers are standard. The CM2-Z series offers a variety of mounting options.